Those boots are made for walking, so put your best foot forward and join us for a fabulous walk around Aldridge under the stars. On Saturday 15th September hundreds of ladies from across the region will get their sparkle on and revel in the unforgettable atmosphere of our famous ladies-only Starlight Walk whilst raising money for St Giles Hospice. It really will be a girls’ night out to remember so gather your friends, Mum, sisters, cousins and aunties and join in the fun. With all funds raised going directly to help your local hospice, the real stars of the night will be you! Entry is £16 per person. You can choose from a full 7.5 mile walk (2 laps of the 3.75 mile course) or a single lap of 3.75 miles if you prefer. Now open to participants aged 13+ (must be accompanied by participating adult) and don’t forget to pack those fairy wings and fancy dress as well as the walking boots! Moment of reflection in memory of our loved ones. The walk starts. Hot food and drinks will be served at the end of your walk. The team from St Giles will cheer you across the finish line with a hot drink, snack and that all important medal…..as well as a massive thank you from us for being such wonderful supporters of St Giles. For Sue Aldridge, the care the Hospice at Home team in Walsall provided for her husband John made all the difference to their lives in his last weeks. John, a former postman from Bloxwich, was diagnosed with a brain tumour several years ago. For the couple, who were at school together and have been married almost 42 years with three children, the news was devastating. “John had been complaining of a headache for a while and it wasn’t getting any better, so the GP arranged for a scan,” said Sue. 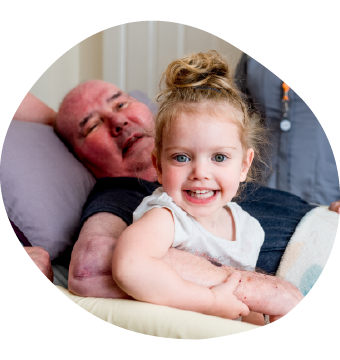 The couple started to receive Hospice at Home support after John was admitted to the Walsall hospice for symptom control. “When the team offered night sits for John I was so relieved. Because of his condition, John would wake 7-8 times a night,” said Sue. “Being able to get a good night’s sleep made all the difference in my ability to cope – I had some of my darkest days after John had a few bad nights. I really can’t praise the team enough for their kindness and exceptional care for John and their brilliant support of all the family,” said Sue.